I shot this photograph in October of 2013. And I did not digitally remove the picturesque Minneapolis skyline. That was done thanks to Mother Nature. We had a VERY heavy fog on that October day. I noticed as I was driving by downtown on my way home that you couldn't see any of the buildings. The fog was very light or non-existant outside of the downtown area. But that downtown area had it bad. I live just a few minutes north of downtown Minneapolis, so once I got home I quickly grabbed my camera and headed back down to the St. Anthony Main area that is just across the Mississippi River from the downtown skyline, and I was happy to have made it back there before the fog lifted off. 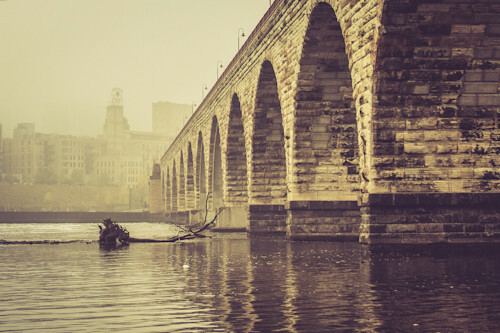 Once I got there, I climbed down the closed off stairwell and got down below the Stone Arch Bridge. I absolutely loved the view from down there. Well, ok, I always love the view from down there, but it was surreal seeing it on this day. The skyline was gone. You could not see it at all. The IDS, the Wells Fargo Tower, the Capella Tower, and all other towers were just not there. You could still see all of the old vintage Mill District buildings that sit right on the river banks. But the thick fog ate up all of the skyscrapers. I then captured this scene on my camera and it has such a vintage look to it that I had to title it Vintage Minneapolis. I hope you enjoy this Vintage Minneapolis Skyline Photograph, and please feel free to share it! Vintage Minneapolis Photograph as Fine Art.